Gretel Girl draws....: Hey Presto?! First comes the idea, then the sketching, then the scanning & photoshop-ing, and the colouring. Then the printing & the reprinting for all the late night mistakes. There is the very important choice of fabrics & the wonderful op-shopping experience to acquire those fabrics. 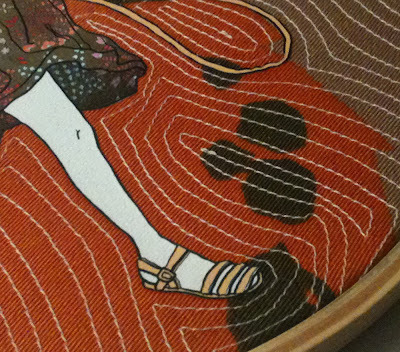 Then the marriage of an illustration & fabric. The addition of sewing detail is a subtle feature, but so important in my eyes & my favourite pieces always end up being those that are the most time-consuming! A hanging wire is attached to the hoop. 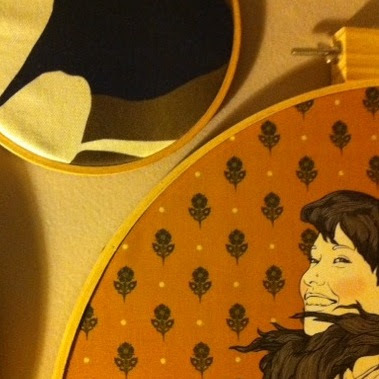 Then, lastly the printed/sewn illustration can be stretched & fixed in the hoop. Presto!.. (I know, a ridiculous word to use for such a detailed process) its done! I need to sew pretty details & contour lines tonight, but I am ever so tired... the thoughts of Vintage Carousel keep me going... Not long now. These look so intricate and pretty! You certainly have a unique talent.